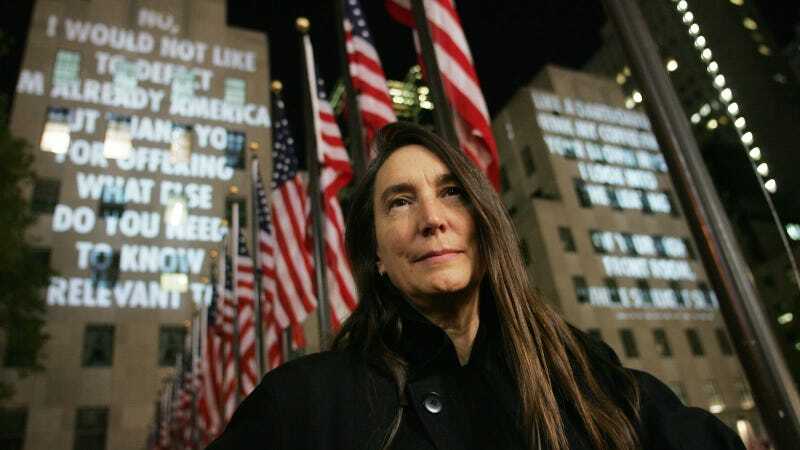 Jenny Holzer. Image via AP. The letter credits Landesman’s case as an igniting factor for a discussion of how abuse is upheld within the art industry, but MOMA PS1 curator Ruba Katrib told the NYT that he is but one perpetrator and the letter is just a first step. Artforum has initiated its own internal reckoning, with staff signing another public letter regarding Landesman, stating they’re committed to “to gender justice and to the eradication of sexual harassment in the art community and beyond.” Beyond must be everywhere, because lately it seems there is no place to go in a career or for simple entertainment that is free of sexual harassment. Art! Correction/Update: An earlier version of this story identified the signatories as solely women; in fact, they include all genders, including trans and nonbinary/nonconforming people. Additionally, an earlier version of this story noted that 500 people started the letter; in fact, it was written by 150 people, launched with 1800 signatories, and by 5 p.m. Monday, had grown to 5000 signatories. Jezebel regrets the error.